The funny thing about Josh Trumper’s fan art submission is that I have an eerily similar page in my Outwitters sketchbook. I couldn’t have done a better job assigning roles for the Tilt to Live power ups myself. In fact, I didn’t… His are more clever. 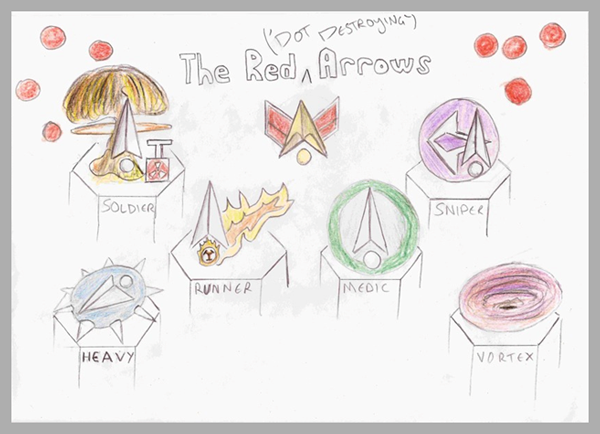 In his own words: “The Red Dot Destroying Arrows are a team of silent types who enjoy nothing but setting off power ups and killing red dots… and they’re all out of dots.” I kid you not, Josh has 3 paragraphs of very specific ideas for his Vortex special character, an invulnerable sinkhole that consumes friends and foes alike. He even suggested a 3 turn countdown before the Vortex activates, just like Tilt to Live. Someone has a bright future in game design ahead of them. For his time and effort, Josh is getting the item of his choice from our Tilt to Live store. If you have some One Man Left fanart & are over the age of 13, send it over to contests[at]onemanleft.com. If we like your stuff, we’ll post it and send you a free item from our shop. 😀 it’d be fun to have the arrow become playable in outwitters too… I hope this becomes a reality. Please please PLEASE make this real! That would be such an awesome crossover! Seriously, it would rival Mario and Sonic meeting each other at the olympics. This should become a secret unlockable team in Outwitters! Yeah, you can play as these ONLY if you’re a Super-Titan. We’ve toyed with the idea, but if we want to release this thing anytime soon we need to stay focused. It could make a fun update, though.